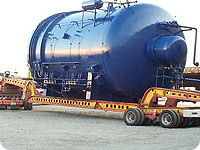 Melco Steel, Inc. designs and builds autoclaves suitable for processing high-performance composite components. 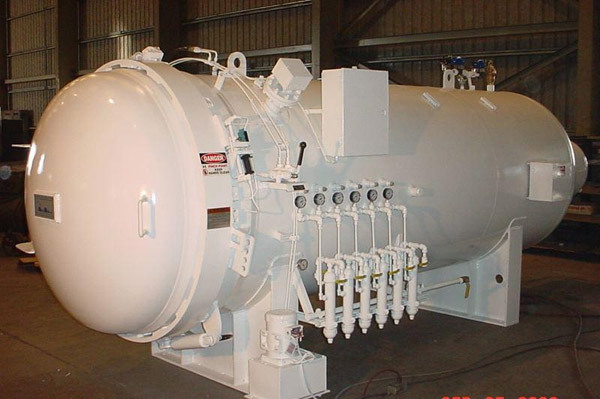 We construct composite autoclaves in compliance with ASME Boiler and Pressure Vessel Code Section VIII, Division 1 standards. 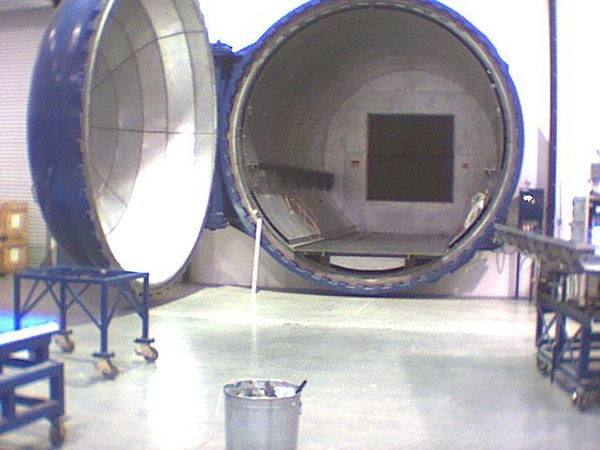 Designed to fulfill specific composite curing and bonding requirements, our autoclave systems are available in standard as well as custom models with sizes up to 32' in diameter and 200' in length. 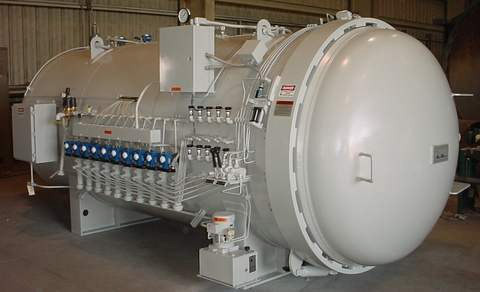 Depending on specific application requirements, composite autoclave systems can be fabricated from carbon steel or stainless steel plates with thicknesses up to 8". Composite autoclaves can be manufactured to process parts at curing pressures as high as 3,000 psi and operating temperatures close to 1500°F. Our composite bonding autoclaves are suitable for processing parts used in medical and pharmaceutical industries. The key component of Melco Steel autoclaves is the custom-built, breech lock Harris quick-opening door. Standard features include part temperature monitoring, automated vacuum control, interactive screens, and multilevel security options. We specialize in developing computer controls designed specifically for composite bonding and curing autoclaves. Typical safety features of our composite autoclaves include 'Operator-Inside' alarms, over-pressure & over-temperature protection options, door safety interlocks, and blower motor cooling alarms. 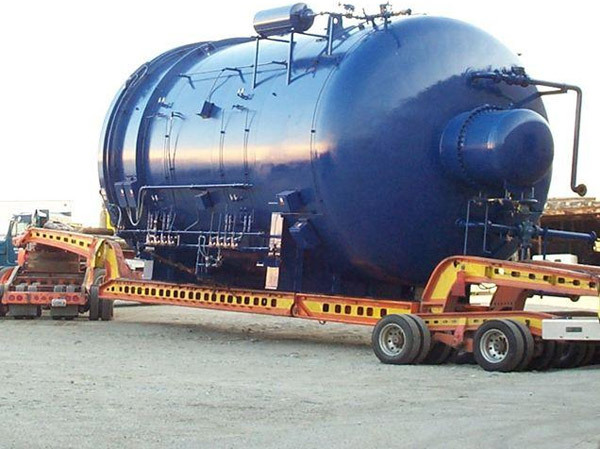 Combining over 25 years of autoclave as well as pressure vessel manufacturing expertise, we offer complete composite autoclave processing solutions, from design and fabrication to testing. Encapsulated blower motor eliminates the high maintenance necessary for through the vessel shaft sealing. Proprietary blower motor design allows operation at any combination of pressure and temperature. Engineered circulating fan assures excellent heat transfer to the load and exceptional temperature uniformity. 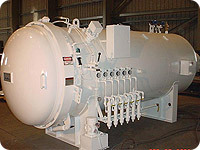 Proprietary method of placing and securing insulation minimizes heat loss through the pressure vessel and minimizes operating costs. Location of typical electrical heating unit is shielded by cooling coil to prevent radiant heating of load. 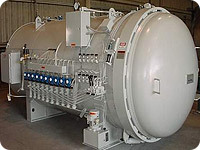 Cooling coil is a single pass heat exchanger designed for precise temperature control with ample provisions for thermal expansion to minimize thermally induced stresses and failure. "Man-Inside" emergency alarm cables are provided on larger autoclaves which allows operator to completely disable all autoclave sub-systems. It requires autoclave door to be opened to reset the alarm. Load track and floor is designed to allow for thermal expansion yet provide full structural support. ASME approved safety relief valve and rupture disc are provided on separate vessel penetrations to assure independent and safe operation. Many other redundant safeties are incorporated to assure operator and equipment protection. Most vessel penetrations, such as vacuum, thermocouple and cooling are built into removable and replaceable ANSI flanges. This allows easy modification or repairs without compromising the structural integrity of the vessel. This proprietary breech lock door allows full and easy access to the autoclave interior within one minute after completion of a curing cycle. Safety is inherent in its design, but we also include mechanical, hydraulic, electrical, and pneumatic interlocks to prevent door operation while the autoclave is pressurized. No relative motion of the door with respect to the pressure seal provides long o-ring life. An oxygen sensor/fresh air purge safety interlock is available to prevent opening the door unless safe levels of oxygen are present. This complies with recent OSHA rulings.